I've go two very inspirational challenges to work from for today's card. 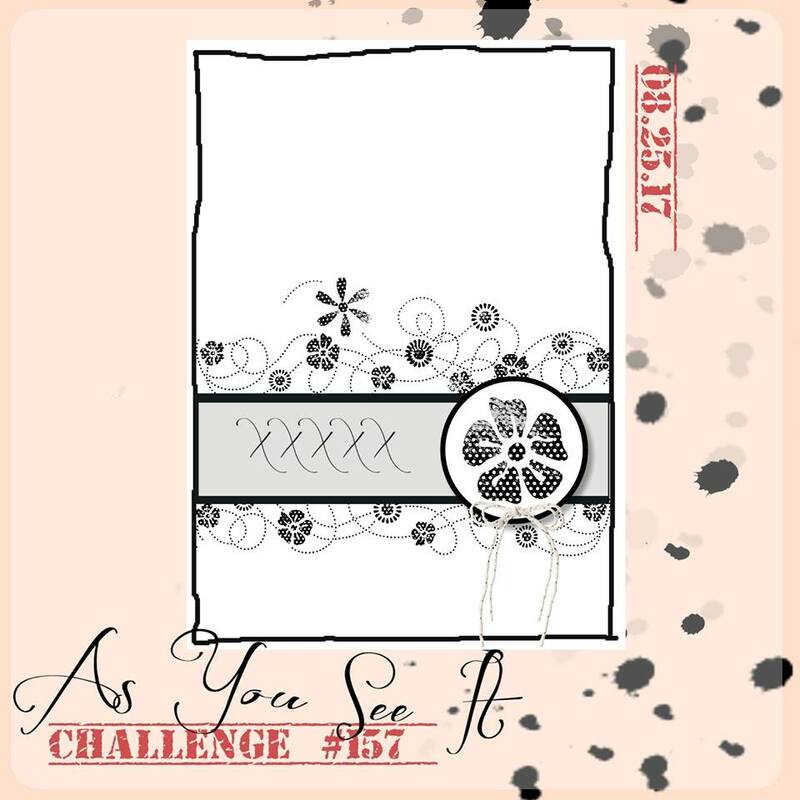 First is As You See It Challenge #157, for which I had to design a DT sample! It's a unique sketch challenge, unique as only Amanda can make it! 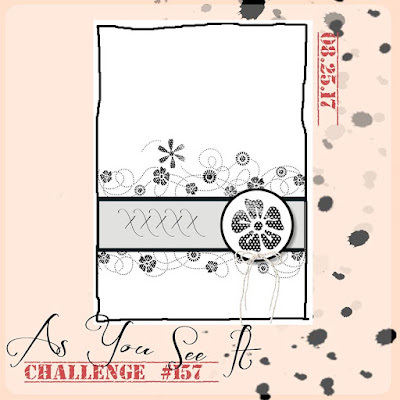 The challenge is entitled Flower Frenzy, although you certainly don't have to use flowers on your design, but I immediately thought of an August garden, run riot! At the peak of it's glory, full bloom and full foliage, vines running amok and general gorgeousness before the autumn frosts begin! And the stamp set that that vision suggested to me was Flourishing Phrases along with the coordinating Flourish Thinlits! I actually used the Flourish Thinlits more than the Flourishing Phrases stamp set on this card because they seemed made to order for this particular challenge. And if you have been reading my blog lately, you know I've been making good use of the Multipurpose Adhesive Sheets with my intricate die cuts, by applying the adhesive sheet to the cardstock before die cutting and turning each die cut into a sticker which is simple to apply with no glue globs to worry about! Very easy to use! I'm sold! 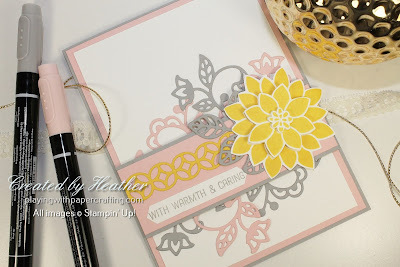 I got out my Smoky Slate, Powder Pink and Daffodil Delight cardstock and ink to comply with the Color Throwdown challenge and I'm loving this combination! It's one to tuck away for further use later. I stamped and hand cut the yellow flower three times, each time cutting a smaller and smaller layer and added them to the largest layer using Mini Stampin' Dimensionals to add depth and dimension. The sentiment is from Flourishing Phrases, but the bottom line "FROM ME" was masked out and then the top line was able to be punched out using the Classic Label Punch. I hope you can take a little time to play along with Amanda's great sketch this weekend. Just upload your photo to a public site such as Pinterest, Splitcoast Stampers, or your own blog, copy the URL and paste it on the linky tool to enter! Have fun! 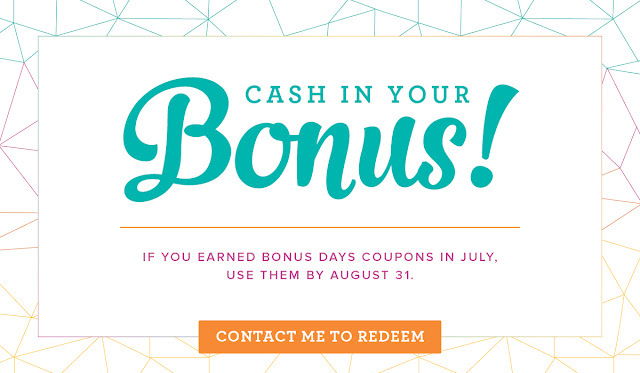 Just a reminder that time is running out to redeem your Bonus Days Coupons that you earned in July. 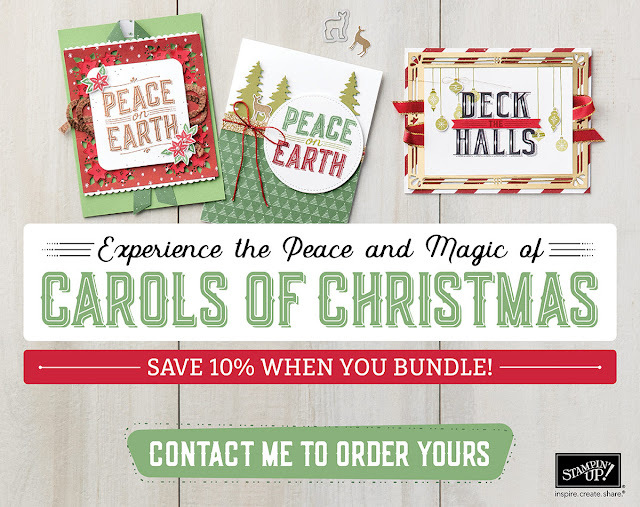 You have until Aug. 31 to use them on all the great stuff in the Annual Catalogue or get the new Carols of Christmas Bundle! You'll be glad you did! !